Clicking on the image will take you to the firm's website. Indian motorcycle parts 1901-1953 for your American made Indian motorcycle. We are an Indian motorcycle parts manufacturer and retailer, of antique Indian motorcycle parts. Jerry Greer's Engineering and Indian Motorcycle Parts and Accessories 1936 - 1953. Highest quality parts available for 1936 - 1953 Indian Motorcycles. Worlds Largest Supplier of Quality Vintage, Classic, & Antique Indian Motorcycle Parts, Accessories, and Complete Restorations! Built to Ride - Built to Last. Dedicated to keeping Indians alive. Spare parts, rebuilding services and our vast experience of rebuilding almost any part of your Indian Motorcycle. 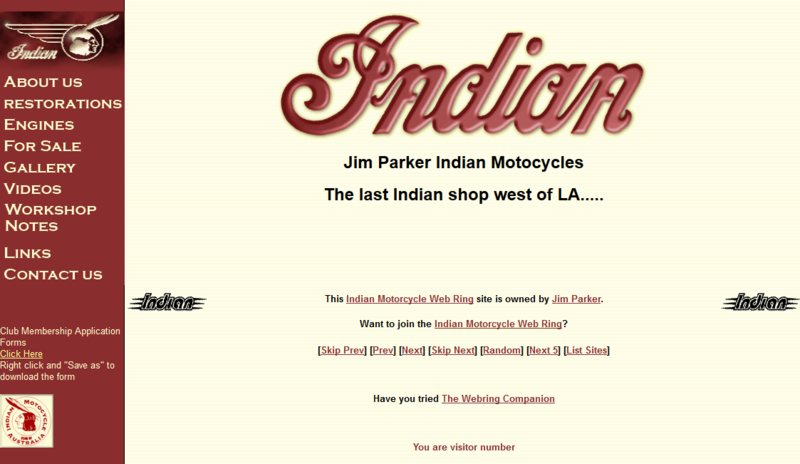 Welcome to Parker Indian - we offer a full restoration service on all Vintage Indian Motocycles.